BY ECOM, launched by a South Korean beauty social media influencer. As a beauty creator for many years, she has been using a wide range of products, but still had problem to find the perfect product. So she went and made a brand of her own melting her experience and taste. 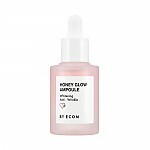 Radiant your Skin Care with the [BY ECOM] Honey Glow Mist 80ml! we aim to provide you best korean products to take good care of your skin, including Cosmetics, Moisturizer, Face Mist. Hydra Face Mist online. 3 in 1 Mist. Moisture, nutrition, and glow at the same time! Make glow and moisturized skin with the mist including Vitamin. Spray it on your face from the 20-30cm away whenever your skin feel dry. Close your eyes and spray it evenly over your face.